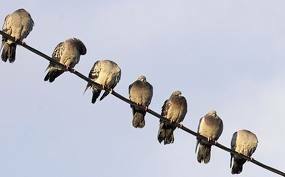 ELECTRONICS GURUKULAM: Why, when birds sit on transmission lines or current wires doesn't get shock? 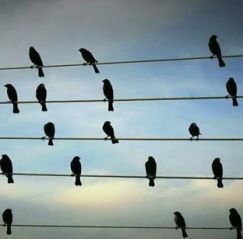 Why, when birds sit on transmission lines or current wires doesn't get shock? Its true that if birds touch the single one line (phase or neutral) they don't get electrical shock... if birds touch 2 lines then the circuit is closed and they get electrical shock..
so if a human touch single one line(phase) then he doesn't get shock if he is in the air (not touching or standing on the ground). if he is standing on the ground then touching the line (phase) he will get a shock because the ground on what we standing is like line (ground bed - like neutral)। and in the most of electric lines the neutral is grounded..so that means that human who touch the line closes the circuit between phase and neutral.